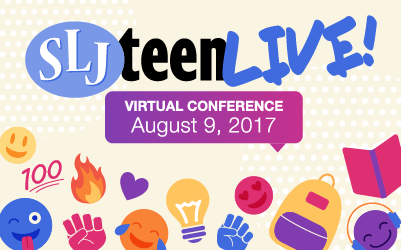 On August 9, 2017 SLJ’s sixth annual virtual conference on all things YA lit and teen librarian services kicked off to a strong start with an inspirational opening keynote by the award-winning Benjamin Alire Sáenz. The author of Aristotle and Dante Discover the Secrets of the Universe and his most recent The Inexplicable Logic of My Life (Clarion, 2017) shared with attendees how he came to write books for young adults and why working with teens is a “vocation.” The free, all-day event featured panels on social justice, immigration, and feminism in YA lit and offered professional development sessions on coding, maker spaces, baking at the library, and more. For a snapshot of SLJTeen Live! and a sneak peek at the other keynotes (Reshma Saujani and Barry Lyga), take a look at the Storify we compiled. Or, if you didn’t get to attend the event live, check out our archive, available now.